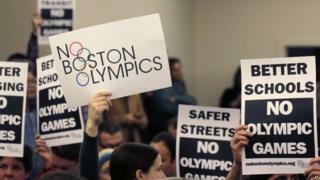 The city of Boston and the US Olympic Committee (USOC) have agreed to end a bid for the 2024 Olympics because of a lack of public support. The bid had faced opposition, with many people concerned that local funds would be used to pay for cost overruns. The decision means that another US city will have the opportunity to bid for the Games. The US has until 15 September to submit a bid to the International Olympic Committee (IOC). Analysts say Los Angeles is now likely to be the frontrunner to be selected as the US candidate. In a statement, USOC chief Scott Blackmun said the short time before a bid must be submitted meant that not enough public support could be mustered. "The USOC does not think that the level of support enjoyed by Boston's bid would allow it to prevail over great bids from Paris, Rome, Hamburg, Budapest or Toronto," he said. Mr Blackmun added that USOC will explore the possibility of entering a different city in September's bid. One concern of local opposition groups was that the cost of the Games would have risen far higher than the estimated $4.6bn (£3bn). London's 2012 Olympic and Paralympic Games cost $13bn, according to UK government figures. Image caption Boston Mayor Marty Walsh will not "put taxpayers at risk"
Boston Mayor Marty Walsh said: "No benefit is so great that it is worth handing over the financial future of our city and our citizens were rightly hesitant to be supportive as a result." Earlier on Monday, Mr Walsh had said he would "refuse to mortgage the future of the city away". Boston was selected as the designated US host city in February after beating off competition from Los Angeles, San Francisco and Washington DC. The last time the USA hosted a summer games was in Atlanta in 1996. Salt Lake City, Utah, hosted the Winter Olympics in 2002.